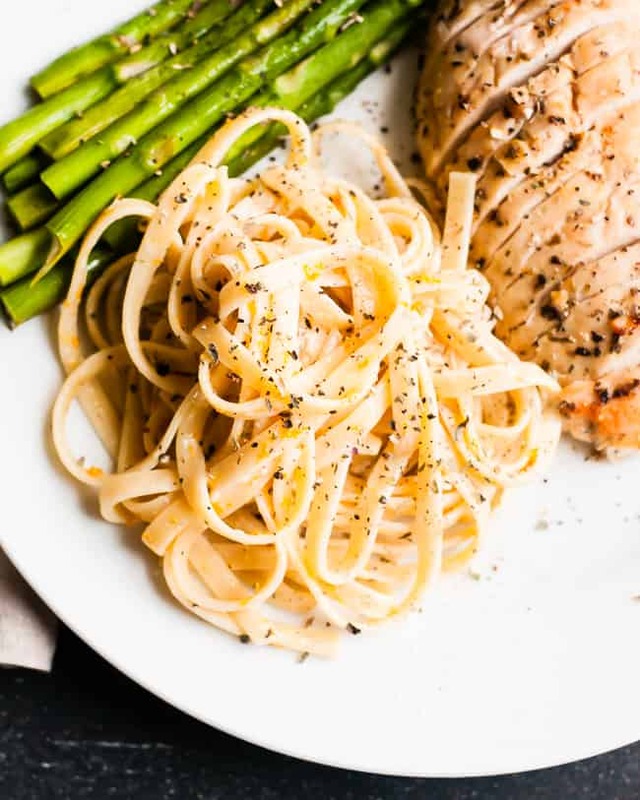 Fettuccine Alfredo is a classic restaurant dish that’s also really easy to prepare at home. The one caveat is that it’s incredibly rich – sometimes too rich. 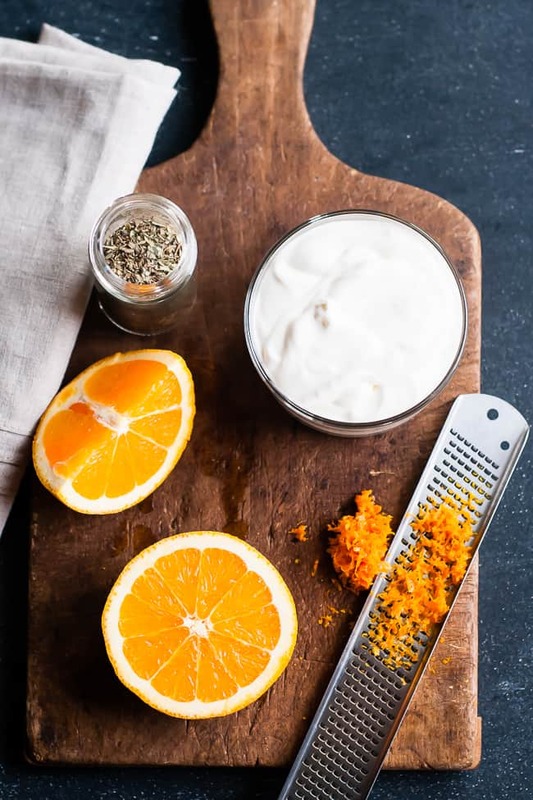 And as delicious as it is, I wondered if I could create a lightened up version that relied on herbs and citrus rather than tons of butter, cream and cheese to give it rich flavor. And I think I did it! I based my sauce on a pasta dish from one of my favorite local restaurants. What makes is special is the hint of orange hidden in the rich Alfredo sauce. So I recreated it using tangy creme fraiche and fresh squeezed orange juice and finely grated zest, along with dried Italian herbs and a little fresh garlic. Mix the sauce ingredients together in a bowl then add the hot, drained pasta. Let it sit for a few minutes to absorb some of the sauce then serve it with baked chicken and asparagus. It’s not exactly a 30-minute meal, but it comes together faster than the time it takes to drive to a restaurant, wait for a table and order from the menu. Plus it’s every bit as good as anything you’ll get at a restaurant – and you’ll save a zillion calories. Approximately. 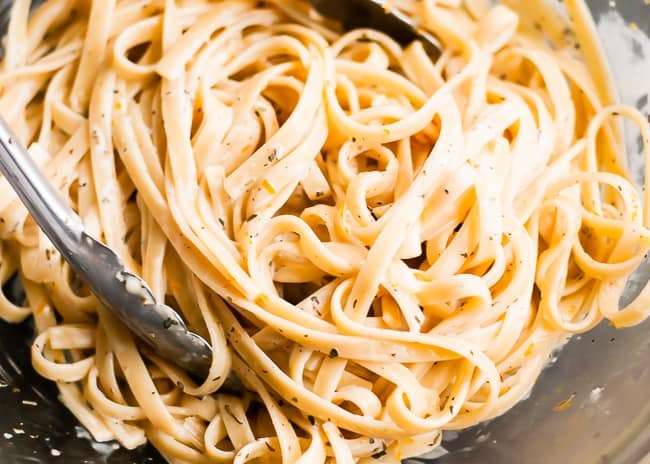 A filling pasta dish with a light, creamy orange and herb sauce made with tangy creme fraiche. Whisk zest and juice, creme fraiche, herbs, salt and pepper together in a large serving bowl. Place hot pasta in the bowl with the sauce. Toss to coat. Let stand for a few minutes to allow some of the sauce to be absorbed. The sauce will also thicken from the heat of the pasta. Serve hot. For the asparagus, just put it on the same pan as the chicken during the last 10-15 minutes of the baking time and it’s perfect. Orange, garlic and herbs give the chicken a lot of flavor with a hint of sweetness. Combine orange juice, olive oil, vinegar, herbs, salt and pepper in a shallow baking dish. Place chicken breasts in the marinade. Cover and refrigerate for several hour or overnight. Turn halfway through for even marinating. To cook - preheat oven to 425 degrees F. Line a baking sheet with parchment paper. 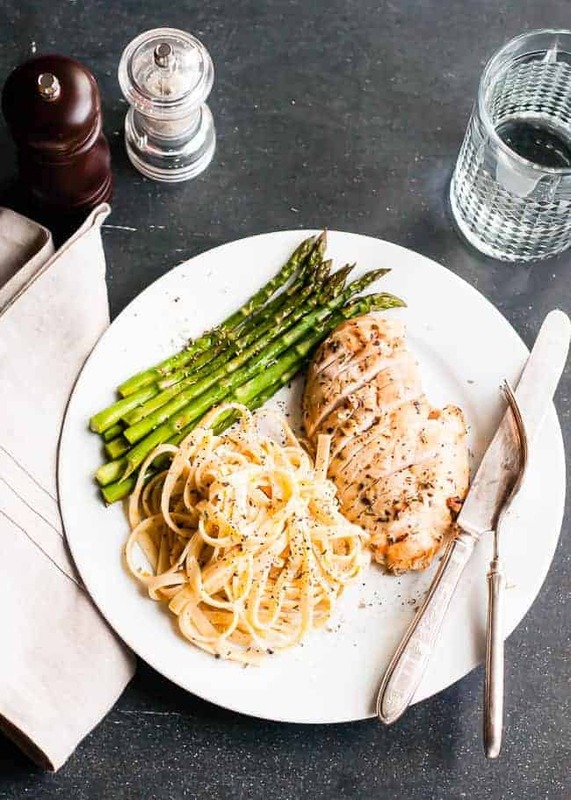 Place the chicken breasts on the lined baking sheet and bake for 30-45 minutes, or until juices run clear and the internal temperature is 160 degrees F. Remove from pan and let stand for a few minutes to allow the juices to be reabsorbed. Thinly slice and serve. The resulting sauce is pretty darn fantastic. It’s amazing how just a few simple ingredients can create something that tastes so good! 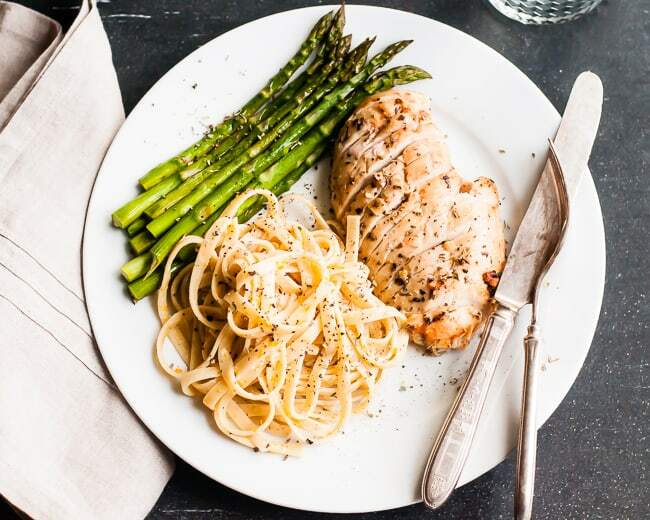 I served it up with citrus-herb marinated chicken and quick roasted asparagus. It makes a lot of pasta, so you’ll have plenty for lunch or dinner the next day. Sounds fabulous! And okay for diabetics. Thank you, thank you, thank you. Ooh I’m intrigued by the orange in the pasta – gotta try this!